Goose berry (Phyllanthus emblica L.) is one of the richest sources of ascorbic acid. Barthakur and Arnold (1991) estimated that the berry contain 5889 ppm. Ascorbic acid. Apart from this the berry contain sugars, various minerals, amino acids and vitamins etc all of which play important role in the nutrition of silkworm and silk production (Shyamala and Bhat, 1965; Subbu Rathinam and Sulochana Chetty, 1990; Ito, 1960; and Ito, 1966). 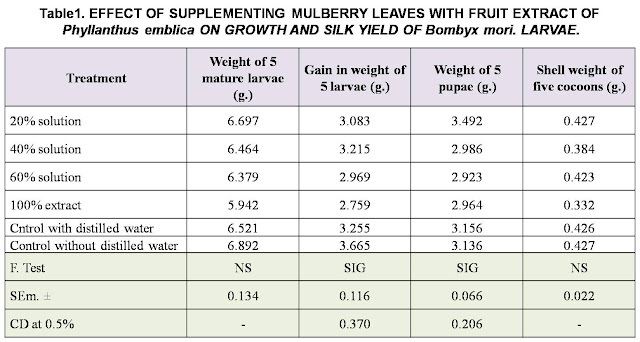 In the current experiment mulberry leaves were supplemented with goose berry extract to study its effect on growth and silk production of silkworm. Mature fruits of Phyllanthus emblica were procured from the department of Horticulture, University of Agricultural Sciences, Bangalore. The fruits were crushed in a stone mortar and the juice extracted through a cheese cloth was collected in amber coloured bottles and corked air tight. From the extract 20%, 40%, 60% and 100% concentrations were prepared using distilled water as diluents. The pH of the various concentrations prepared were 4.2, 2.75, 2.73 and 2.68 respectively. Each concentration served as a treatment. A distilled water control and another control without water were also maintained. Each treatment was replicated thrice. The concentrations were prepared every day fresh and were kept under room temperature. Mulberry leaves were dipped in these solutions shade dried and fed to the larvae twice a day, other feeds being un treated. The experiment was conducted on 360 fifth instar larvae of C-Nichi race of Bombyx mori reared as recommented by Dandin et al. (2000). Each replication carried twenty larvae. The larvae were fed on mulberry variety M5. The observations made were: weight of five mature larvae, 5 pupae, shell weight of 5 cocoons and gain in larval weight. The data was statistically analysed. The mature larval weight did not differ significantly among the treatments. Gain in larval weight was significantly higher in control (without water), other treatments on par with each other. Pupal weight was significantly higher in the 20% solution treatment, other treatments being on par with each other. Cocoon shell weight did not differ significantly among treatments. It was observed that the larvae did not relish the leaves treated with higher concentrations. This may be due to the low pH. It is also observed that the larvae fed on higher concentrations had longer larval duration, took more time for pupation and showed pupal deformities and high post cocoon mortality. Some larvae remained inside the cocoon without undergoing pupation. Lower concentrations did not affect pupation. These observations call for further investigations in the same line using lower concentrations of the emblica fruit extract as a food additive to silkworms, to prolong laraval duration and to mprove silk yield. Ito,T. 1978. Silkworm nutrition: In the Silkworm an Important Laboratory Tool. Tazima,Y.(Ed.) Kodansha Ltd, Tokyo. 121-157. Legay, J.M.1958. Recent advances in silkworm nutrition. Ann.Rev.Ent.,3:75-86.